The latest Economist provides some interesting macro perspective for the global economy. 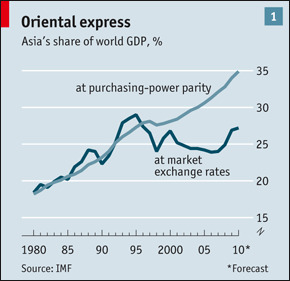 Yet a closer look at the figures suggests that the shift in economic power from West to East can be exaggerated. Thanks partly to falling currencies, Asia’s total share of world GDP (in nominal terms at market exchange rates) has actually slipped, from 29% in 1995 to 27% last year (see chart 1). In 2009 Asia’s total GDP exceeded America’s but was still slightly smaller than western Europe’s (although it could overtake the latter this year). To put it another way, the output of the rich West is still almost twice as big as that of the East. As for the popular belief that Asian producers are grabbing an ever-larger slice of exports, the region’s 31% share of world exports last year was not much higher than in 1995 (28%) and remains smaller than western Europe’s. Indeed, the shift towards Asia appears to have slowed, not quickened. Its share of world output and exports surged during the 1980s and early 1990s. Although China’s share has grown since then, this has been largely offset by the decline in Japan, whose share of output and exports has halved. Just don’t forget the two important ‘buts’ here. One is that Asian economies are a lot larger if measured based on purchasing power parity, which is basically whereby one adjusts currency values so that a basket of similar products in each country would have the same global price. The other is that Japan’s decline has been a huge drag on Asia’s aggregate data. Ex-Japan, Asia would look a lot better than the above statements suggest.